This brand-new test is designed to identify reading problems in young children. It can be used by classroom teachers, special educators, speech pathologists, and school psychologists. There are three core subtests focusing on print competence, the results of which are combined to create the Early Reading Index; two supplemental subtests focus on nonprint correlates of reading. Written Word Vocabulary, which measures print knowledge. The child is shown a picture or letter with five choices (words, letters, numerals, or symbols) and must point to the choice that is a match. Rapid Orthographic Naming, to assess letter-word identification and comprehension knowledge. The child is shown a stimulus card containing pictures, letters, numerals, and words, and is given 60 seconds to name as many as he or she can. Silent Orthographic Efficiency, which evaluates the speed with which children can match letters and words. The child is shown a stimulus box that contains a letter or word and is instructed to mark the one of five choices that contains the same text that appears in the stimulus box. The child is given 60 seconds to respond to as many items as he or she can. 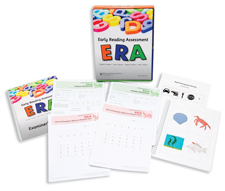 Scores from these three core subtests are combined to form a composite standard score, the Early Reading Index (ERI). The ERI has neither floor nor ceiling effects at any age level. Phonological Awareness, which measures the ability to discriminate among and manipulate phonemes. The child deletes phonemes, affixes, or words from words spoken by the examiner. Receptive Vocabulary, which measures understanding of common vocabulary. The child points to the picture of a word spoken by the examinee. The ERA was normed on a representative sample of 1,001 children from eight states. The reliability coefficients for all the subtests exceed 0.80. The reliability for the index is 0.94. Scores for the ERA core subtests showed large to very large correlations to five criterion reading scores (TOPEL, TERA-3, WJ III, TOSWRF, and TOSREC). Administration time is 10-15 minutes. 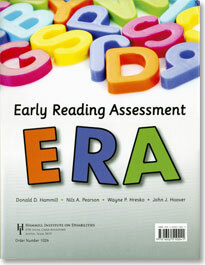 The ERA yields age equivalents, percentile ranks, scaled scores, and the composite ERI.